Old Baggage by Lissa Evans – Review. Crooked Heart was a book that I enjoyed very much so I was thrilled to see that Old Baggage had been published. You could say that it is a prequel, focusing on Mattie who was Noel’s godmother. She was only in the first chapter of Crooked Heart but it was evident that she was a character who had much to say. Most of this novel takes place in 1928. Mattie lives with the brilliantly named ‘The Flea’. She isn’t hesitant at making her feelings known,not always with tact, and it’s something that gets her into trouble more than once. I did have some sympathy for The Flea, and in a lot of ways she was the character I preferred. I liked her reading about helping those who were worse off and her quiet devotion to Mattie. I spent much of the novel trying to work out the connection with Noel and thankfully it was revealed who his mother was. She was the person I expected it to be, and at first I thought her reasoning for her actions a little cold but on reflection I don’t think they were. Just honest. I enjoyed reading Mattie’s memories of her life as a suffragette, it would be brilliant to read another ‘prequel’ and learn more. Funny, poignant, honest, and revealing. Not just personally but also with attitudes at the time. Old Baggage is one that will be just as successful as Crooked Heart. 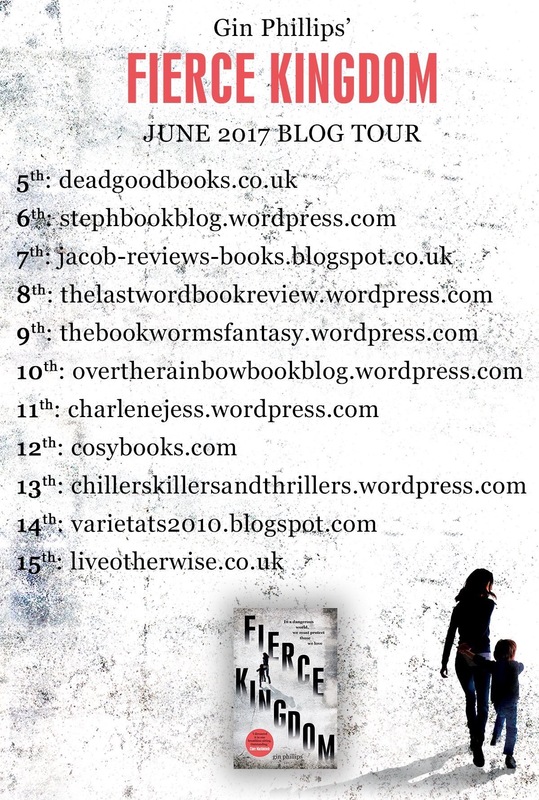 Fierce Kingdom by Gin Phillips – Blog Tour Review. Joan takes her son Lincoln to the zoo regularly. The trip starts just like any other but when they start to make their way to the exit they find themselves in danger. Gunmen are in the zoo and are shooting people and animals at random. Joan has to keep herself and her son safe and try and leave the zoo without being seen. She knows that she will not be able to use the exit so she needs to find the best place to keep them both safe until the situation is brought under control. Much of the storyline is focused on the relationship between Joan and Lincoln. There is the danger they are in but the way she attempts to keep him calm, relaxed and communicating is a strong point in the novel. I loved his little stories and the way they interacted. But there are also small parts of the novel that focus on one of the gunman, a zoo worker and a retired teacher who was also visiting the zoo at the time. Two of these people have had a connection in the past, the teacher and the gunman. This, along with the teacher’s memories of former pupils was one of the parts of the novel that lingered in my thoughts. Another, very chilling moment concerned what was found in a trash can. The decision that Joan had to make, ignoring any emotions, just to stay safe. The period of time covered is only a short one but the author demonstrates very well how even a short time can feel like an eternity when survival is at stake. I have seen some comments about the ending on other reviews but I liked it. I thought it was real, life continues without onlookers and I didn’t necessarily need to know what happened to each of the individuals concerned.